Watch them rise! 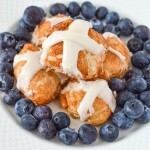 Jesus Resurrection Hot Cross Cinnamon Buns are a fun way to teach your child about the rise of Jesus on Easter Sunday. These are so easy to make that your child can make it practically by themselves the morning of Easter Sunday. Tear apart the buttermilk biscuits and place into preferred pan, my mini chef wanted a mama and baby pan today. Once all the biscuits are the desired size roll them up and put a little butter on them. Roll the biscuits into the cinnamon sugar and place back into the pan. Bake the biscuits for 10-12 minutes. While baking combine the glaze ingredients on low heat until combined. Allow biscuits to cool before icing. Use zipper plastic baggie to glaze buns or a piping bag.